7 tips to LinkedIn Profile Perfection (Part 2) - Need a New Gig? In Part 1 of this three-part blog series, we discussed the first three vital tips to help enhance your LinkedIn profile. The first section focused on cleaning up your photo, introduction, and experience. 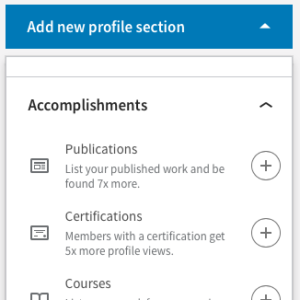 If you have already completed part 1 your LinkedIn profile is well on it’s way to perfection! 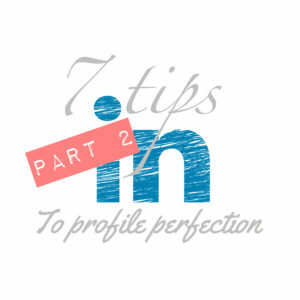 If you missed Part 1, click here to check it out: 7 Tips to LinkedIn Profile Perfection Part #1. Part 2 will provide information to help you add your skills and accomplishments. The skills or endorsement section of your profile is a somewhat newer piece that was added a few years back, but it is another great tool when it comes to your job search. By adding skills to your profile it allows employers to find you when they search for certain key words. So what skills should you add? As a job seeker it is most important to add skills that you have that relate to the type of position that you are seeking. You want to list the skills that you have gained in your career, but it is important to keep them recent and relevant. Some candidates make the mistake of listing every skill that they have gained throughout their career, which could be a setback. Some professionals believe that when candidates list skills from early in their career that are no longer relevant it makes them look like more of a generalist as opposed to a specialist. When looking for a certain type of role it is important to try and match up as closely to the job description as possible. Be sure to list any skills that you have that match what they are looking for. This could include anything along the lines of buzzwords, software experience, certifications, daily job responsibilities, etc. To add/edit skills click the pencil icon next to “add new skill” when on your profile page. 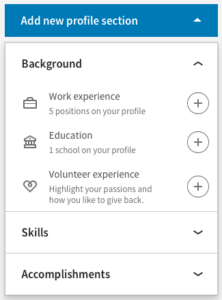 If you do not have any skills listed on your profile click on the “add new profile section” in the top right hand corner of your profile. So what are endorsements? Endorsements really go hand in hand with your skills. They are an easy way for someone to “endorse” your experience without having to take the time to write a full recommendation. Since it is like a mini recommendation these can only come from 1st degree connections, which makes it even more important to expand your network. We will talk about growing your network in step 7. Depending on the company or recruiter that you are working with endorsements may not really mean all that much, but I still think it is a great idea. I feel that any positive career endorsement can only help you! With that being said, be sure to ask colleagues or managers that you work with to endorse you and don’t forget to return the favor! As I mentioned at the beginning of Part 1, your LinkedIn profile should serve as your live resume if you are on the hunt for a new job. LinkedIn gives you many different ways to display your expertise and adding accomplishments is another great option. Most of these are self-explanatory and LinkedIn also provides a summary under each accomplishment that you are able to add. This is another way to get more traffic to your profile and views by potential employers. Look back at your career and think of anything applicable that can be added. Employers tend to look at past performance as a key indicator to future performance so this is another section that can really showcase what you have done. Now you have completed the basic steps when it comes to adding and updating the information on your profile. Looks nice right? We’ll be back soon with part 3 as we give our final tips on how to use that polished profile! Dan Metz is the Director of Executive Search and Employee Development at the Resilience Group, LLC, and Co-Founder and Contributing Author for Need a New Gig. Follow his blog for more great tips like this! We'll guide you on the how-to of financial freedom in this 7-day email course! Great! Now check your email for the course! I look forward to walking down this path of success with you! This entry was posted in LinkedIn and tagged Add accomplishments, Add skills, How To, Job Search, LinkedIn, update LinkedIn Profile. Bookmark the permalink.